Bruce Howard Sparks was born on June 8, 1925 in Bakersville, NC to Reuben Stokes Sparks and Louise Gouge Sparks. He was their last surviving child. He was a retired United States Navy Master Chief who served his country for 26 years during WWII, Korea, and Vietnam. 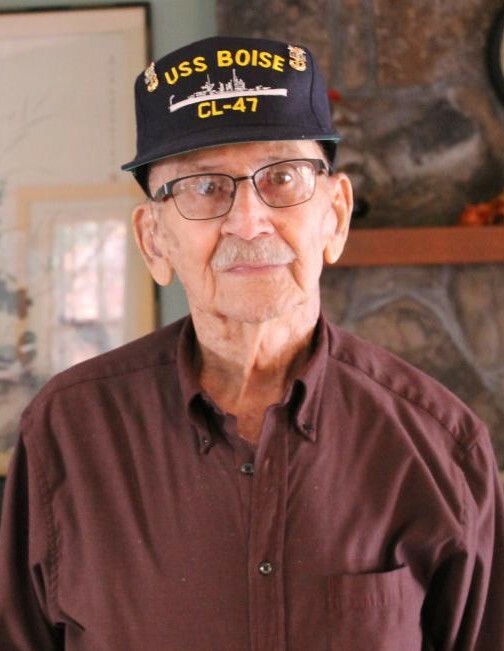 He spent two years of active duty aboard the USS Boise CL-47 in the Pacific. The Boise was a light cruiser that sank several enemy ships, shot down enemy aircraft and bombarded enemy positions to protect US troops. He passed away at the age of 93 years on October 15, 2018 in the presence of his loving family. He leaves his devoted wife of 70 years, Gladys Johnson Sparks of Spruce Pine, NC. Also, one daughter, Janis Sparks of Beaufort, SC, two grandchildren John Hartz of Front Royal, VA and Mary Chapman and husband Brandon of Beaufort, SC and two great-granddaughters Ava and Ella Chapman. There are also several nieces and nephews. He was an avid reader, gardener, golfer and member of the Grassy Creek Golf Club for 30 years. There will be no services or flowers. The family would like to thank Hospice for their wonderful care of him for the last two years. Memorials may be made in his honor to Hospice of the Blue Ridge, 236 Hospital Drive, Spruce Pine, NC 28777.